Ohio is a land of diverse geological features. Among the most unusual and spectacular formations are its natural rock bridges. Ohio has at least 12 such bridges. 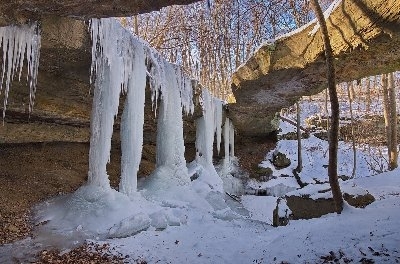 Rockbridge Winter Scene - I remember it well. It gets really slippery behind that ice formation. I went down and busted my tripod, among other things. 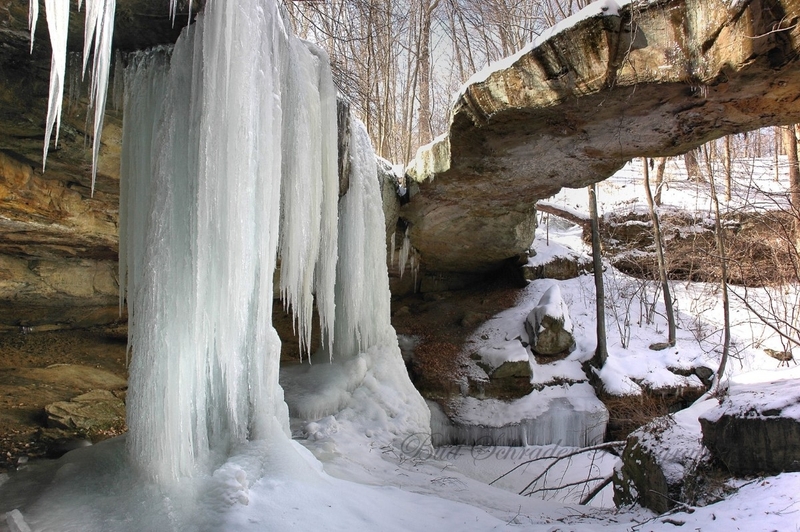 Rockbridge Natural Bridge originated millions of years ago, when Ohio lay under a warm inland sea. Rivers flowed into the vast body of water, carrying both fine and coarse grained sands which settled to the sea bottom. Over the centuries, the accumulating sand thickened, compressed and formed the hard sedimentary rock known as Black Hand Sandstone. Eventually, great pressure from beneath the earth's surface caused the land in eastern North America to rise, forming the Appalachian Mountains. The inland sea soon drained away, exposing the newly uncovered rock layers to steady erosional processes. The natural bridge soon began emerging in all its grandeur. Wind, rain and percolating groundwater worked together for centuries, carving a deep cave-like recess in the softer midportion of the Mississippian Black Hand Sandstone. Gradually, erosional forces also worked along a natural joint plane some distance behind the brink of the cliff. Over the centuries, this ongoing process has widened the crevice, and all that remains of the overhanging ledge is the narrow rock arch. Rockbridge, Bottom View - Yhis photo is SO old. I don't get back there near enough. The natural arch or bridge known as Rockbridge is more than 100 feet long and 10 to 20 feet wide, and gracefully arches 50 feet across a ravine. 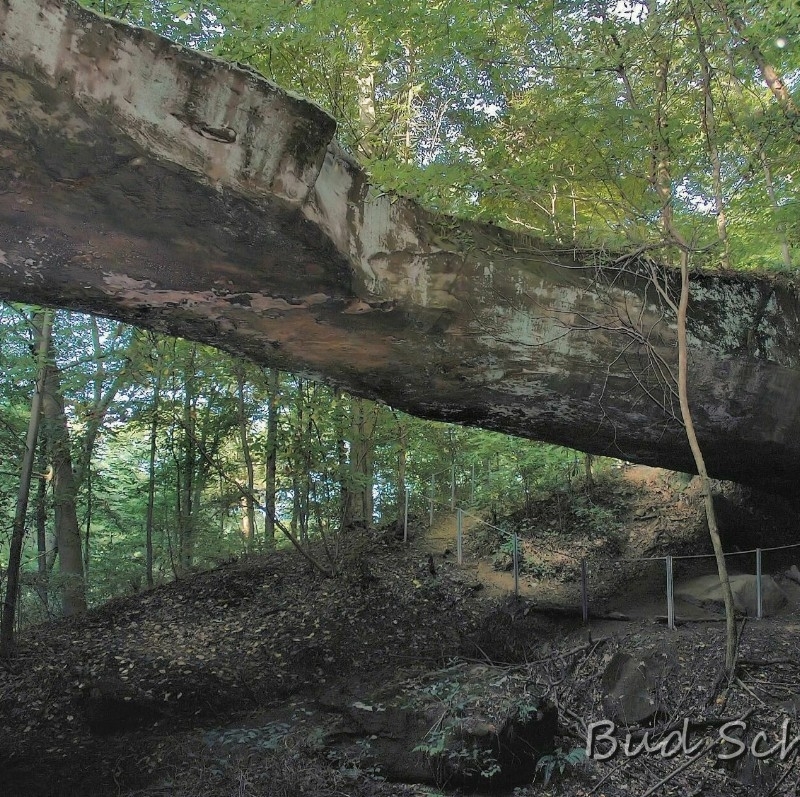 It is considered the largest natural bridge in the state. 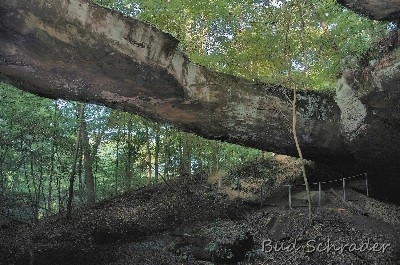 Only the Ladd Natural Bridge in Washington County rivals it in size.